Photographer Mariette Roodenburg, who was raised in the Netherlands and has made Nova Scotia her home, pulls a distinctive palette from the natural beauty of Key West. Cool blues and silver streaks accentuate the seascape and bring a coolness and stillness to the tropics. 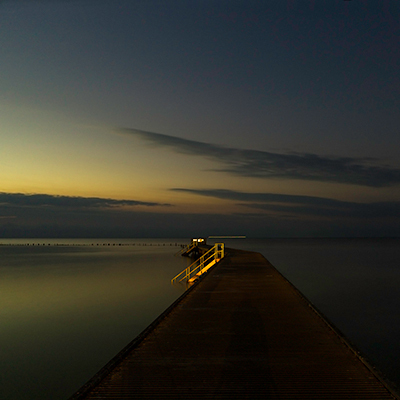 When Roodenburg was a resident at TSKW in 2013, she spent her month in paradise working to perfectly capture the unique light of that place where water meets sky; the almost mythological quietude that can saturate the waters of Key West. Now Roodenburg returns to Key West to exhibit the final results of so many days spent studying tides, sunrises, sunsets. In addition to exhibiting her first Key West body of work, Roodenburg also plans to spend her time building upon what she started last year; switching gears from photographing during the windy days of January 2013 to capturing the glassy seas of early summer 2014.